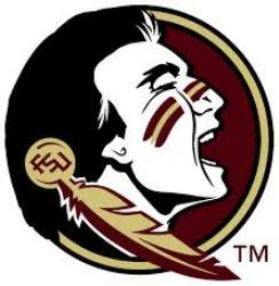 Home > US Sports > NCAA > FSU Football 2015 Season Predictions! January the Florida State Seminoles streak came to an embarrassing end in the 59-20 game against Oregon in the College Football Playoffs. Thanks to another top 5 recruiting class and the transfer of Quarterback Everett Golson FSU keeps the hopes and dreams of another CFP return. To start on this year FSU loses 12 starters including six on offense and six on defense. But they return Dalvin Cook on offense who was the first running back in FSU history to get to 1,000 yards as a freshman. They also return the whole linebacking core with Senior Terrance Smith and Reggie Northrup. Also they have star DB Jalen Ramsey who will most likely be a first team All-American and probably is the best DB right now. In late January FSU announced their 2016 schedule and its intriguing and im gonna tell you why. First they start off with a 8 pm home game against Texas State which will likely be on Espn3. This match up is interesting to me because it is a cupcake game and I believe we will finally see a FSU beat down after a season of close games predicted score:48-10. Next is a home game against South Florida at 11:30 a.m. yes a.m. not many times will you see a FSU game kickoff before college gameday is over with. It’s obviously a inter-state game and the last time these two teams met FSU won this game 30-17 I see FSU taking this one 31-17. Next they dig into the conference schedule with a 8 pm Friday night game at Boston College. Now traditionally FSU tends to struggle with playing away games during the week I believe they will make a tremendous comeback effort winning the 4th quarter 13-0 and winning the game 27-24. After the tough week night game they have to go to Winston-Salem to play Wake Forest.The last time the two played there it was FSU defense who forced six turnovers in the 59-3 blowout my prediction 52-10. After the blowout they have to deal with their rivals from down south Miami. Now Miami leaves questions because of their captains leaving on offense and defense but I believe their Sophomore Quarterback Brad Kaaya will help put up a small fight. My prediction is that FSU will extend the streak to six years and the final score will be 28-17. After the battle with the hurricanes FSU have to play Louisville. Last year FSU was down 21-7 at half-time to go on an amazing 35-10 display to win 42-31. This year is gonna be different and its in Tallahassee my prediction 34-10. This paragraph starts the next half of the season and the Noles will be 6-0 and bowl eligible. To start they have to go to Atlanta to play the Georgia Tech Yellow Jackets. This was a great game in the ACC championship last year and this is one game a lot of “experts” say FSU will lose. I believe it will be a very psychical game and I believe it will be hard for the young defensive line to keep up with the fierce option attack. When the game is all over I believe it will be FSU on top 30-24. After the physicality is over FSU will endure a another challenge against Syracuse. I believe Syracuse will shock a lot of people this year and Terrel Hunt will be an amazing quarterback this year. It’s in Tallahassee this year not the Dome and I believe they should take care of them 37-24. Next they meet the biggest competition in their division the Clemson Tigers in Death Valley. Now the last time they played there Florida State gave Clemson the whooping of a life time but I believe Clemson has learned their lesson and this shall be the game of the ages sorta like last year. It will be hyped up on ESPN all week it will probably will be the site of gameday a 8 pm game. FSU will come in 8-0 and Clemson will be 7-0. Both teams will be in the top 10 and it will be amazing. Both teams will be clicking on all cylinders for the first three quarters and the score will be 21-17 FSU wins to end the game. NC State will be the next opponent at home and the last time these two met in Tallahassee FSU scored 35 points in the First Quarter yes in real life. Everett will come out good I believe throwing 2 Td’s’ in the first half and Jimbo draining the clock in the second half. Final score will be 24-10 and FSU will have 10 victories in a season for the 4th year straight. Next they would have another cupcake before their regular season finale with Florida. Chattanooga im going to be straight forward and just say first shut out of the year. Final score will be 56-0 and it might be a chance for the starters to get some rest who knows maybe the third string Quarterback will get in. Last is Florida in Gainesville which I believe may be a noon game. This will be a struggling Florida team with a brand new coaching staff and a team that has a 50/50 at a bowl season. I believe this match up maybe easier than the old folks expect we are looking at a long game for the Florida Gators with a score of 31-10. After this FSU will likely play a rematch with Georgia Tech in the ACC Championship win that and go on to the CFP’s and make the championship.